Salt the radish, let sit for 30 minutes, rinse and squeeze dry. Parboil the bean sprouts in 1/4 cup water, covered, for 4 minutes, drain and let cool. Mix everything with your hands until well combined. Enjoy fresh or let it sit at room temperature for a half a day to let fermentation start. Store in fridge and enjoy chilled. Kevin, I have some bean sprouts that I 'sprouted' and are just waiting to be used in something besides a salad. Also you do kimchi frequently, so even tho I know that diakon are diff. from red American I have a processor so just might throw everything in. Do I really have to blanch the sprouts? What say you? Kevin, You never cease to amaze me! Yum, another mouth watering recipe. I love kimchi. I just started following your blog. You have an AWESOME collection here, I can't wait to try some of your recipes. I like the colour of this meal! I remember my grandmother making kimchi using radishes. I doubt if it's still called kimchi though, because it didn't have the reddish hue! 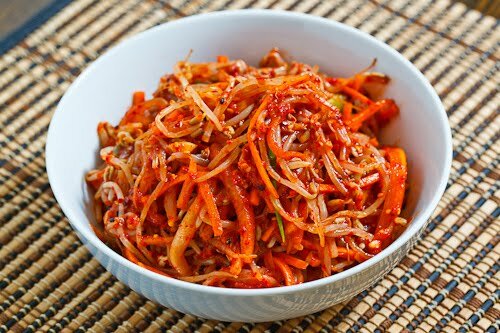 But this beansprout kimchi looks good~ There should be some beansprouts around the house, since we had fried springrolls stuffed with beansprouts and some other kinds of vegetables.. There's another blogger, Sophia, of Burp and Slurp, who is a kimchi fanatic. She mentioned the other day that there are hundreds of kinds of kimchi and I was amazed! This one looks quite delicious. Thanks for including the vegetarian version, can't wait to give it a shot!!!! Hi Kevin. New follower here, jumped the link from Sook's blog: My fabulous recipes. You have a wonderful blog. I'll be back often. I love bean sprouts. Unfortunately, they seem to be overlooked and used in the same recipes. Thanks for a new one! Woo hoo! Anonymous: I think that the fresh bean sprouts would be particularly nice if you wanted to eat it right away, or after letting the flavours meld for an hour or so first anyways. i've always enjoyed reading your blog, and wanted to speak up and tell you what beautiful photos you take and how tasty your foods are looking! How about kimchi mac & cheese? I came up with this when I was putting a seemingly disgusting combo together… kimchi ramen with a slice of processed cheese on top [they do it in south korean fast food places]… kind of oddly satisfying! Wow – Am speechless.. Love your blog! How in the world do you come up with such fascinating and tantalizing recipes?! Fantastic! Best kimchi I’ve had in a while. Replaced the radish with cucumber.